Looking for some further information? Then please feel free to send us an email! We will get back to you right away. 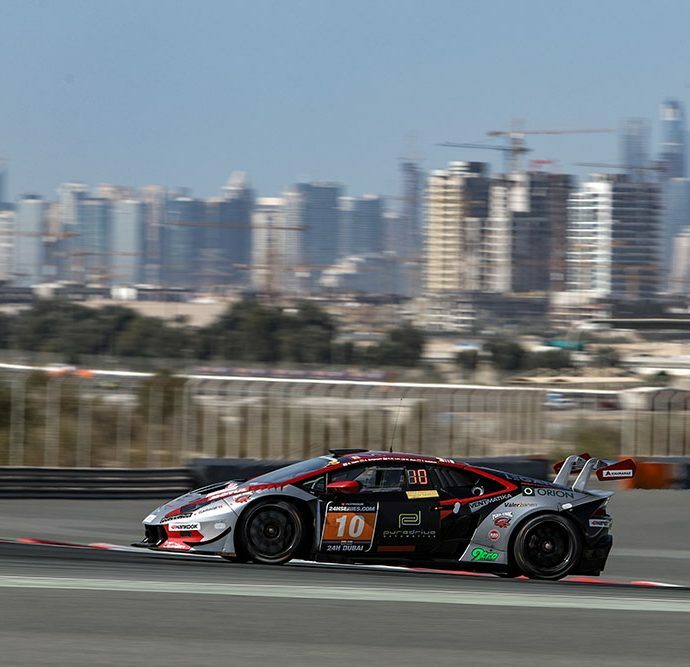 Leipert Motorsport got their 2018 season off to a superb start at the Creventic Dubai 24 Hours, finishing third in class SPX with drivers Oliver Webb (GBR), Aleksander Schjerpen (NOR), Lim Keong Wee (SIN), Melvin Moh (MAS) and Tadas Volbikas (LTU) aboard their Lamborghini Húracan Super Trofeo. With Webb and Schjerpen both returning to the team from 2017, Lim Keong Wee and Melvin Moh were welcome additions as the team set out in hot pursuit of building on their 2017 result, where they narrowly missed out on winning their class. The track action started on Wednesday as the team opted to take part in both of Wednesday’s optional test sessions, to ensure their car was in prime condition having been shipped directly from the Circuit of the Americas and rebuilt for the event in the preceding days in Dubai. Both Wednesday and Thursday’s practice sessions ran faultlessly, with all drivers getting a chance to settle into their surroundings before it was over to Oliver Webb to take charge of Qualifying duties on Thursday afternoon. The former outright race winner and Dubai veteran set the screens alight from the start, instantly stamping his mark at the top of the SPX class timesheets. He wouldn’t be challenged, and by a margin of almost 1.5 seconds, secured a class pole position start for the Leipert Motorsport Lamborghini. Following a successful night time practice and pre-race warm up on Friday morning, the team and their drivers were ready to get 24 hours of hard racing underway around the 5.39 kilometre Dubai Autodrome circuit. Leading the SPX class field away, it was Webb who got the race started for the team, completing a good opening stint to hand the car over to Lim Keong Wee in the class lead and 15th overall. From there, the cycle of drivers would be Lim Keong Wee, Melvin Moh and Aleksander Schjerpen before Webb would return again. From Lim Keong Wee’s stint onwards, the team opted to double stint their drivers to try and work to a defined strategy of keeping their car out of the pits. Into darkness and throughout the night, despite the many dramas around them, the #10 Lamborghini Húracan ran faultlessly, only going into the 15th hour did the car require any major work in the form of a brake pad and disc replacement. As the race started to enter the final hours, the team were now securely holding second in class and starting to conserve their position and their car. However, in what would be their only drama of the race, contact from another car inside the second last hour would spell disaster. With Melvin Moh at the wheel, he quickly brought the Lamborghini into the pits, but the impact then caused a fire in the engine bay just as he stopped in the pitbox. Thanks to the quick reactions of the pit crew, they rapidly extinguished the flames before any further damage was caused, however the incident spelled instant retirement for the team. Luckily, their performance up to that point was enough to keep them on the podium, securing third in class SPX.